After going on about it for months and months, it's finally time (almost) to set off on my bike trip: Kolvarp, Sweden to Istanbul, Turkey. I've gotten lots of help in getting ready - eg my brother and his girlfriend dried vegetables, tofu & beans for me, my mum has been baking, and everyone has put up with me talking about it the whole time. I've got 6 weeks, starting tomorrow morning. I leave from a little village called Kolvarp, then take the ferry from Karlskrona to Gdynia in Poland. Then i'll make my way to Kielce, to visit the Design Centrum Kielce for some ceramics. Then into Slovakia, to see if i can find any bears. Then towards Ljubliana in Slovenia, where my friend has promised to put me in touch with an epic accordion player. After that i'll head down the Croatian coast, and then either into Albania and Macedonia, or else go across Bosnia & Herzegovina and Serbia, through Bulgaria and finally into Turkey to Istanbul! 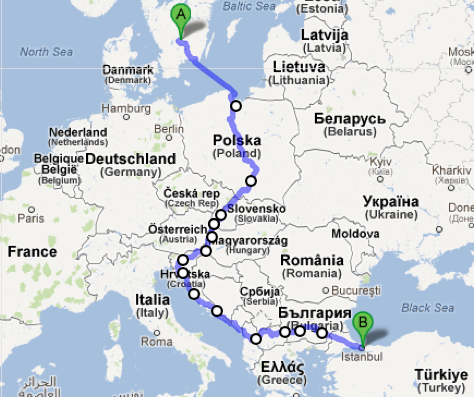 Me and my bike fly from there to London on 13th September. My bike is all ready to go. It's a good old used steel frame, which Graham from the Vintage Bike Cave built for me, and it's lovely to ride. I was having trouble with neck & shoulder pain, but changed to a taller, shorter stem and that seems to have solved the problem. I'll be camping in a little one-person tent, and cooking on a little one-person Trangia stove. Hopefully i'll be able to post something here along the way, otherwise when i get back to London in September.